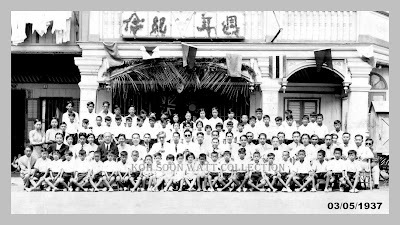 In the early 50’s, a childhood friend barely a year my senior, told me that in 50 years’ time, Sandakan would be a completely different place. Both of us then had no inkling as to what were the dynamic forces that would bring about those changes. Neither did I have a hint that I would in some way play a part in this process. 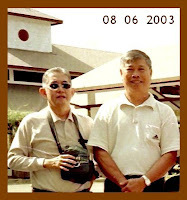 Fifteen years later, I would find myself working as an engineer in the Public Works Department (PWD). My subsequent career, especially during the last 15 years before retirement, would involve me intimately in town planning works associated with Sandakan, especially, the implementation of the pre-planning study for Sandakan in the mid 1980’s. In the following postings, the “before” and “after” scenes of Sandakan taken from the same points about half a century apart are presented. Several scenes even have a longer time lapse. They cover mainly locations that have relevant to me and the circle of friends close to me. Unless otherwise acknowledged, all photographs were taken by me or taken with my camera(s). In creating the “after” shots, it was my intention to get as close to the same spot I took those earlier shots. Obviously, this was impossible in most cases due to various reasons. It is hoped that my photos will evoke vivid childhood memories for those of you who once lived there or who still live there. The first two photos in this post will give us a good general overview of the town of Sandakan during the half-century lapse. 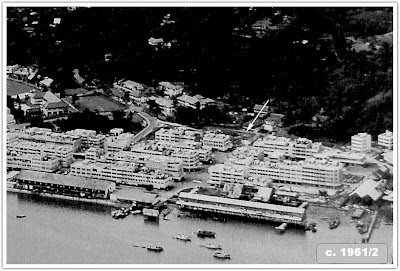 They were definitely taken by others as I haven’t the means, then or now, to charter a plane to capture such aerial views of the town. 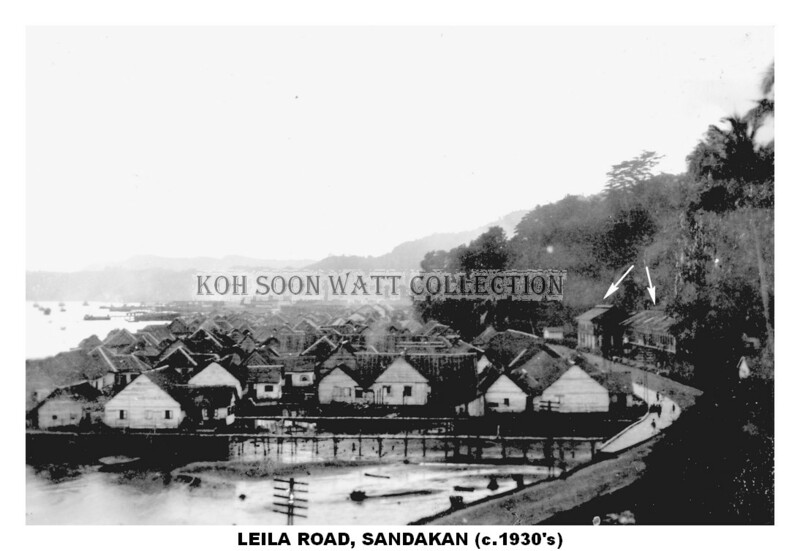 It is interesting to note the existence of small huts supported on stilts along the sea wall of Sandakan. They form parts of the essential sewerage services of those days. Apart from visiting these public conveniences for relief purposes, many of us would use the access bridges and other areas to launch our fishing lines. (Some brave souls would even go on a swimming jaunt and dive into the sea from there!) Fish was plentiful then. Despite being caught from the proximity of those toilets, they were pollution free. 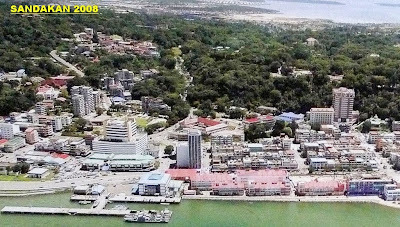 The second pix shows Sandakan in 2008 (as presented in a commercial brochure). Practically the only buildings in the “before” photo still standing are the few permanent Government buildings. Some of them are serving a very different function from their initial role. The Central Market and the Fish Market have been taken down to make way for the Harbour Square Development. Gone too are all those special “fishing platforms” of our childhood days! It has been more than 54 years since I made that first click on a camera that was loaded with real film to create this picture. It was captured with an ancient Kodak Brownie camera which had only two settings – “Outdoor” and “Indoor”. The focus was fixed. For pictures taken outdoor good sunlight was very essential for creating a good picture, as in this case. 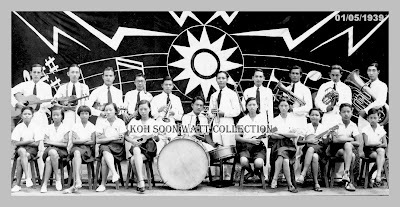 During our family’s stay along Singapore Road in the 50’s, this window scene greeted me every day. 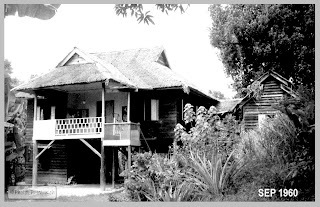 Our house along Singapore Road was also a vantage point for watching sporting and other events which were played out in padang and the basketball court. This "Before" photo shows the distant view of the Post Office and Administrative Building (POAB) in a serene setting. Date palms and other ‘transparent’ flowering trees along that steep road at the side of the POAB complemented this simple view of the building. Not a single vehicle is in sight. 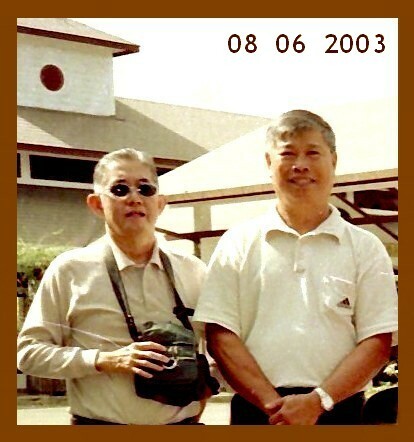 The first concrete basketball court in Sandakan, donated by Mr. Kwan Chai Chin can be clearly seen. 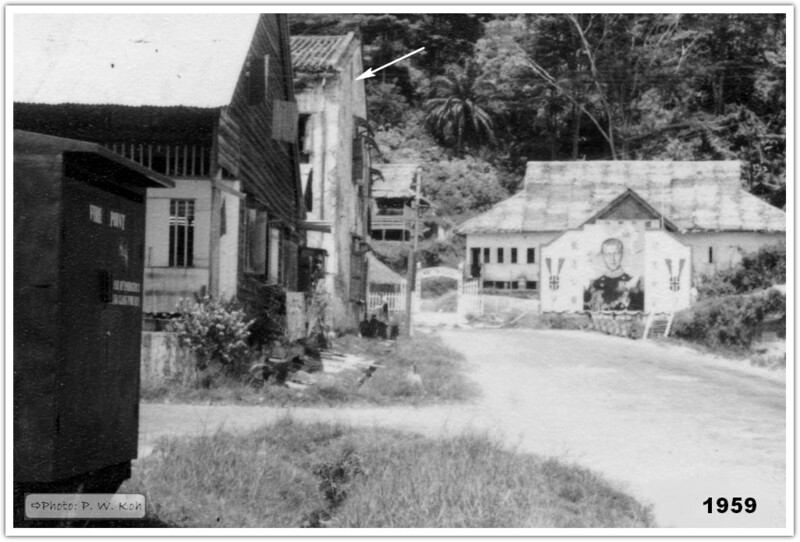 Just to the back of this court, the small track joining the padang’s perimeter road to the steep road forming the first part of the North Road is visible. In the early 50’s, most students living in the Singapore Road area would trek along this path daily to Ming Sing School. Others from North Road areas would move in the opposite direction after alighting from their buses near the present court house and walk to St Mary’s/St Mary's Convent and St Michael Schools. 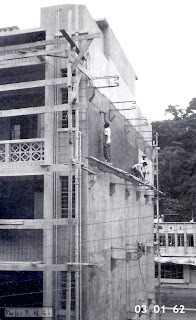 In the foreground of this picture, part of the masonry wall forming the bank of the small Elopura Canal, just across the Singapore Road from my house is discernible. The Elopura Canal served as part of our playground in those days when kids had few entertainment outlets to choose from. One could catch various types of small fish there, or search for “valuables” (e.g. old coins) deposited on the canal’s bed. (Ref. "After 1" Photo) From roughly the same vantage point (but at ground level) these days, one can hardly see the POAB. Your view is blocked by a potpourri of trees, fencing and even cars. A latter construction, the Sandakan Municipal Building, is now lurking to the left of the POAB. The Parker Kwan grandstand has been replaced by a simpler concrete, but not-so-grand-stand. Move the camera into the compound of the padang, and a more recognizable view presents itself (Ref. "After 2" pix). The Chai Chin Basketball Court is still there (attempts by some quarters earlier to remove it failed -- thanks goodness). Still, the dinosaur-like steel trusses supporting the back boards have been replaced by solitary concrete gables. 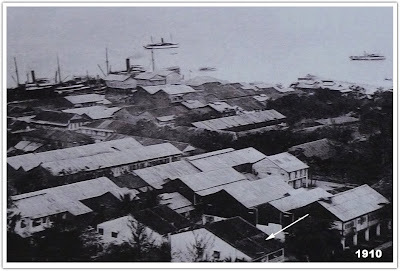 Another new landmark, the Wisma Sandakan, is seen peering over the tree tops at left top corner of the photo. For obvious reasons, all the “before” photos are in B&W. Colour films were available in Sandakan in the 50’s, but they were exorbitantly expensive. The cost of processing and printing which must be done overseas, was also beyond the reach of most individual photographers. 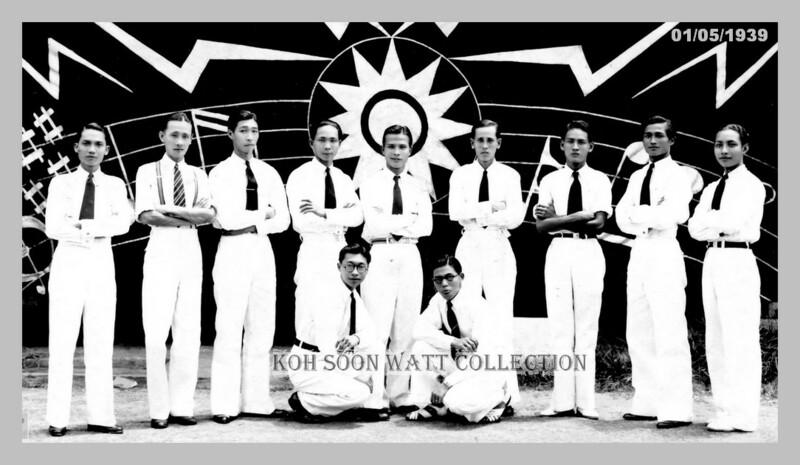 Most of the colour portraitures done by professional studios then were hand tinted. I also tried my hand at hand-tinting after buying a Kodak water colouring kit from Flower Studio. I am surprised that after a lapse of half a century, most of my hand coloured photos appear to fare better than those colour-photos processed by the professional labs overseas. Here is my attempt at hand tinting the first photograph taken by me. 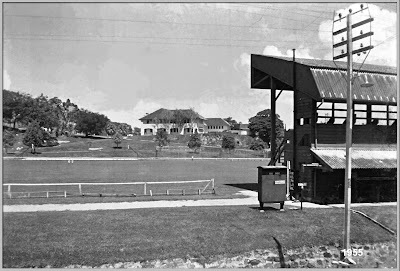 My early life was centred around the padang and part of the road surrounding it. 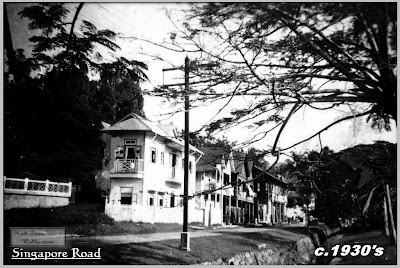 Singapore Road was part the perimeter road system serving residential houses in the proximity of the padang. It extended from the start of the Leila Road, along the Elopura Canal to the SRC and continued on to end at the stepping stones of two small paths. One of these paths led to St. Michael’s and St. Mary’s Schools. The other formed the access to the former Sandakan Hospital located at the present Happy Valley area. Since then, the path to the old hospital had been upgraded to a roadway, connecting Singapore Road to Sung Siew School and on to North Road junction. The road name must have some connection historically with Singapore. It was with dismay that some time back, futile attempts were made to rename it. In the end, good sense prevailed and the name remained intact. This is practically one of the last few roads still bearing its Colonial-day name. 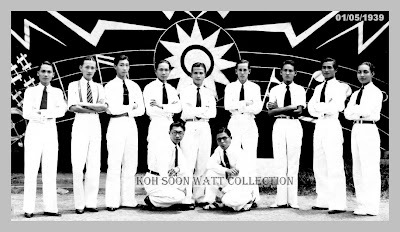 Looking at that 1930’s pix of Singapore Road, at the exact location of the 1950’s row of houses we stayed in, I am completely bowled over by the beauty of the architecture then. The first and the last lots must be the properties of the Funks, as I can still remember the Funks’ matriarch collecting rents from her post-war tenants living there. On the right lower edge, the well-built Elopura Canal is clearly seen. (Probably it was a playground for pre-war kids as well.) On the right, the concrete perimeter fence of the Kwan properties stands prominently. A similar fence, perhaps a post-war reconstruction, still stands there today, although the Kwan families have moved on. 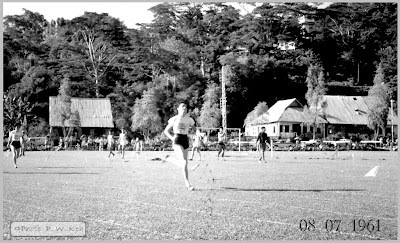 In 1961, Sandakan won the Hone Cup. 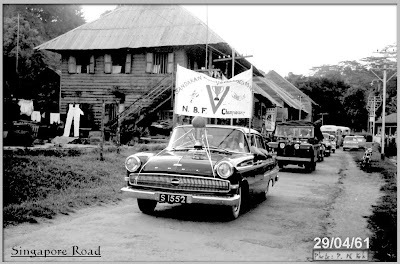 The victory procession had just left its starting point at the Sandakan Recreation Club. 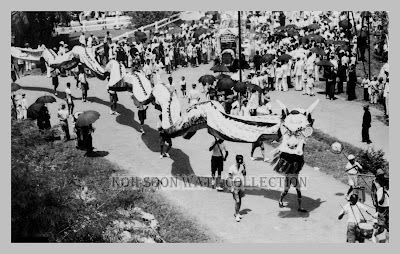 I had positioned myself near the Grand Stand across the Elopura Canal purposely to capture the cup-bearing vehicle as the procession passed the row of houses I used to live in. 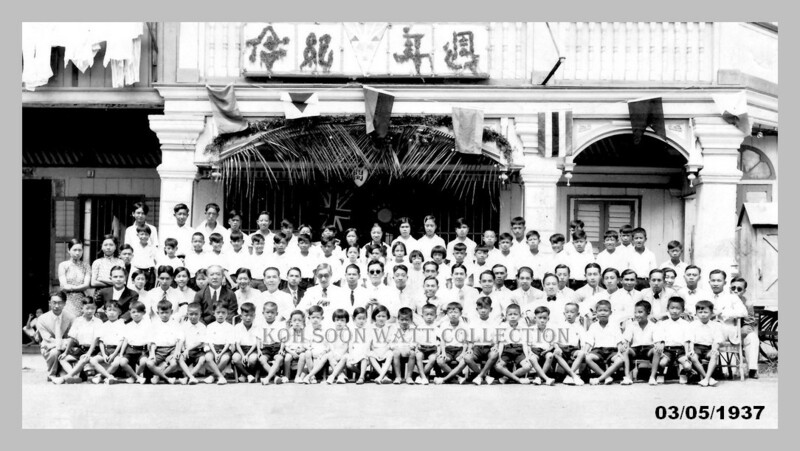 (My family was no longer staying along Singapore Road by then, having moved to Mile 2.75, North Road in 1958.) The reconstructed post-war buildings in this photo look dreadful, compared to those magnificent houses of the 30’s. Still, the sight is very memorable, now that both the Hone Cup Competition and the wooden houses are gone. The Elopura Canal and the Kwan property’s fence are just outside this picture. 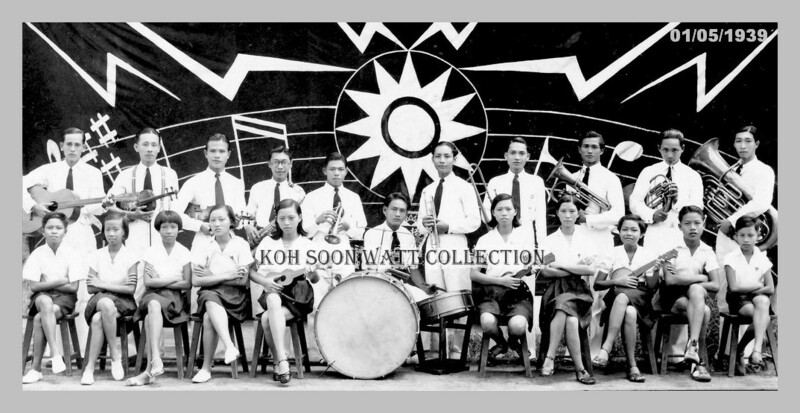 It was a pure coincidence that I had located myself on roughly the same spot as the photographer who took that 1930’s pix. 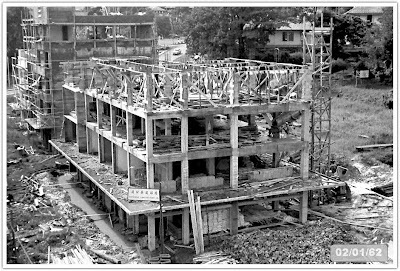 Seventy years on (2008) from the first pix, the scene is completely different as multi-storey concrete blocks now take over. The high-rise dwellers of today must be more elated, having a better vantage point for viewing activities at the padang. Unfortunately, few sporting activities take place at the padang these days: only parades. 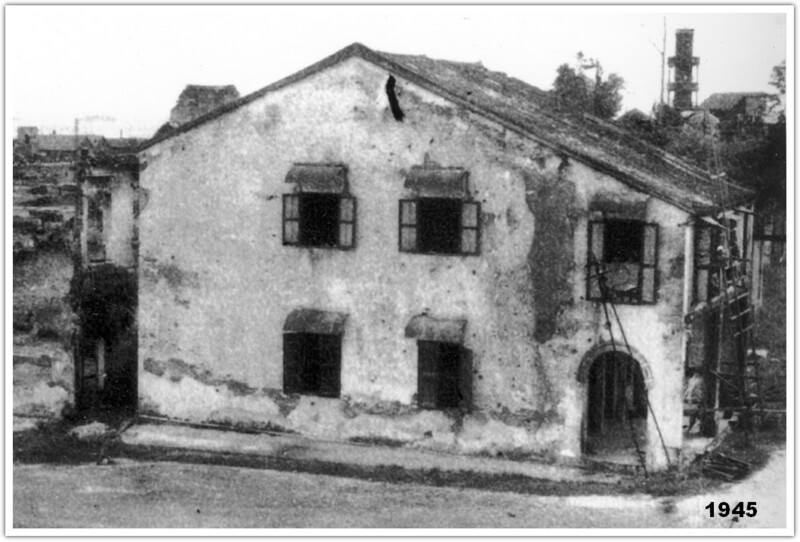 The Kwan family’s mansion is still there, now dilapidated and under different ownership. The concrete fence is now heavily burdened by creepers. What of the Elopura Canal where I and other kids used to spend our free times catching small fishes and looking for 'treasures' carried downstream by storm water? It is now covered over to provide additional car parking lots for the Sandakan Municipal Council. It will not be missed by kids today though, as they have a vast range of electronic gadgets to amuse themselves with. This is the first concrete basketball court in Sandakan, donated by Mr. Kwan Chai Chin. Its completion in the early 50’s was a boon to us, as we were able to play all-weather on a clean concrete surface. 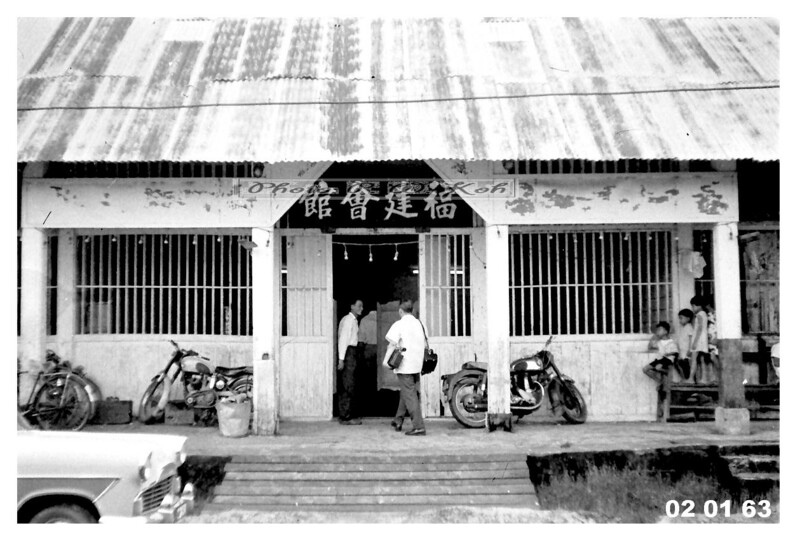 The previous town court for Sandakan located near the Health Centre, off Church Road, had an earth surface. After a game we would be heavily soiled or muddied, especially if the ground was a little wet after a light rain. The main advantage of an earth court was that we could play comfortably without shoes. Nevertheless, the fear of getting blisters on our sores was not a strong deterrence for us to engage on a game bare-footedly on the rough concrete surface of this new court, even at mid day, when the court would be burningly hot. This was less than 10 years after the end of WWII, and shoes, even rubber ones, were relatively expensive. Most of us could only afford one pair which was reserved for school use. (Left) Basketball players' jerseys in the 50's and 60's definitely look smarter and sexier than the baggy ones worn by players today! (Right) My reach seems better today; but I am not going to mimic that same shooting pose 48 years ago.... I can't! 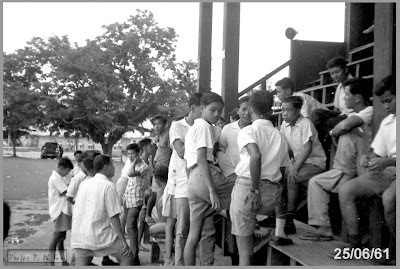 This is the all-timber grandstand designed by Mr. Parker Kwan and built to accommodate spectators attending the parades/events to celebrate the Coronation of QEII in 1952. 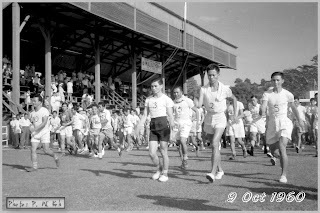 The pix below shows participants at the start of a "Walkathon" race organized by the Rotary Club of Sandakan. The new grandstand, a 1980's RC structure, stands idly today. Most sports activities are now centred at facilities away from the heart of the town. In 1961, a group of boys from St. Mary's (pix below) stay behind at the grandstand "debating" on the highlights of the Inter-schools Sports just completed earlier on. St. Mary's Secondary won the coveted shield that year. 47 years later, I managed to get one of the boys in the 1961 pix to stay behind for this shot. That tree in the back ground looks familiar. The old Rex Cinema is visible in both pix. 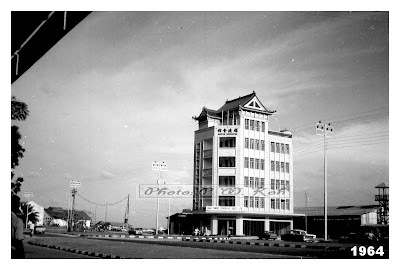 No doubt, the old Sandakan Grandstand was one of the favourite icons to pose against when having your personal photos taken. It gives you that "I was there" feeling. Here (below left) David and Goliath were posing atop the run-off track for the Long Jump pit. The pix of the same spot is shown on the right. ...........David has since narrowed his height with Goliath! Sham Shing Kung Temple was usually the first venue for new dragons, lions and unicorns to pay their respects to the gods before a major festivity like the annual Chinese New Year. In the early 60’s, the Hokkien (Fujian) Association of Sandakan was the first community to re-organize a dragon troupe in Sandakan after WWII. 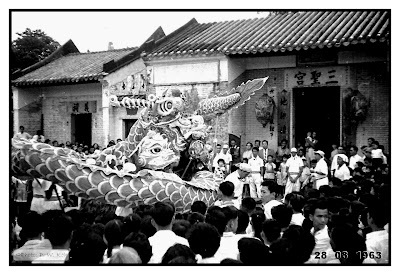 The necessary dragon and the percussion instruments were all imported from overseas. An experienced instructor, Master Tee (郑春虎) was commissioned to train selected clansmen (mainly strong, Hokkien coolies) to handle the dragon artfully. 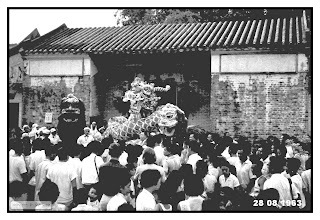 Master Tee was also entrusted with the tasks of training the association’s youths on the art of lion dances, with the two newly acquired “Golden Lions”. 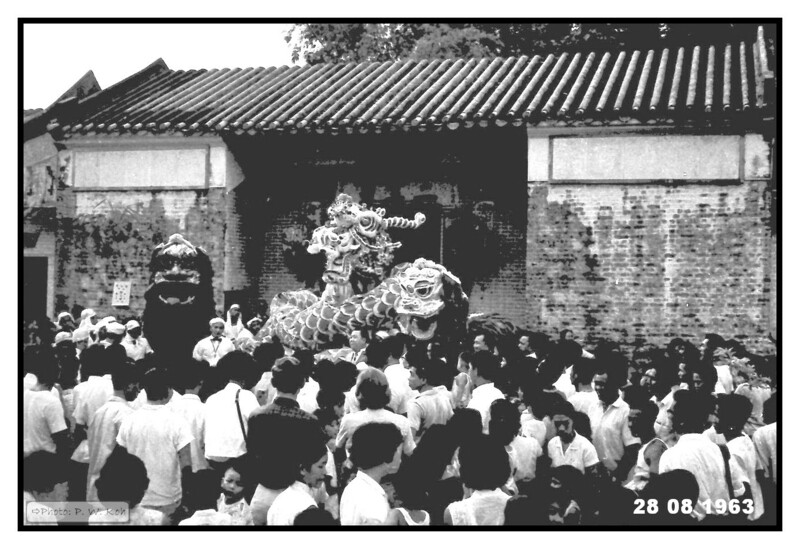 The images below show the Hokkien Association’s dragon and lion troupes during a specially veneration ceremony at the court yard in front of the Sham Shing Kung. Present were all the Association’s top brass. 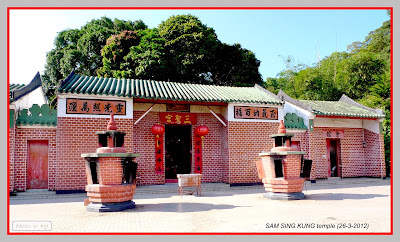 The redecorated Sham Shing Kung, as it appears today. 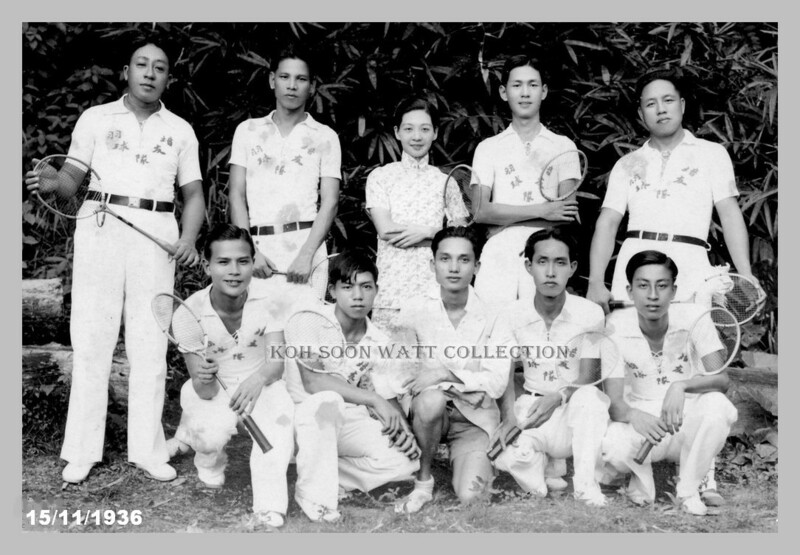 (Left Pix, Ground Floor) The Khoo's (1st Left unit), (Central Unit) Cheong Tam Yin's Furniture Workshop, (Right) Khoo Yong Kim (nick-named "Hawker Khoo", Hone Cup footballer) and his family/His brother in-law's family: the Chong's. The same scene as it looks today. None of the original residents are staying along this stretch. Very few of the current residents there are Chinese. As you turn right at the SRC, the former perimeter road of the padang is now truncated into a dead-end road. The residential houses along this stretch as shown in the pix below are (L-R) a semi-D house owned by the Liew's, next to it is the open space (badminton court), then the semi-D shared by the Ong's and the Abad's. Beyond, are several other houses, some of which are out of the photo. I used to meet up with Hong Kan Jai (Henry Hong) at one of these houses in the 50's before going for our numerous fishing ventures. The same scene today, taken at a slightly different angle is shown at left. Many contributed to the building of the Church -- not least, those students, especially the boarders who were 'drafted' (or on hind-sight, as some now light-heartedly said, 'forced') to carry out numerous vital tasks during its construction. Of course the prime mover for this project was Fr. Mulders, who served as developer, architect and engineer. In addition, he was the initial "operator" for the small bulldozer purchased specially for the earth levelling work (Pix Left). A few years earlier, Fr. Mulders had also completed another major challenge -- the construction of a new block of class rooms for the St. Mary's Primary School for which he was the Principal. 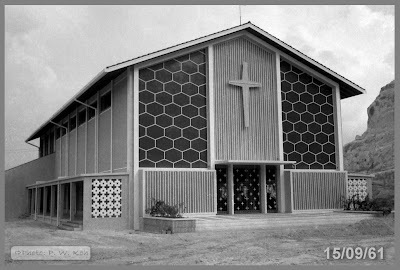 Prior to this, school and church functions were conducted in temporary, post WWII structures, mainly of timber, kajang and attap. In the absence of low-loaders in the 50's, Fr. Mulders' small tractor (an Allis Chalmers) had to crawl its way from the town wharf to the church site. Before this could be done, the Government road had to be protected. This was where the "forced" labour came in as a work-gang, consisting of boarders from the school was ordered to place timber planks for the bulldozer to run on and then shift them to the front as soon as the tractor had passed. On many occasions during the earth works stage, torrential rains carried the loosened earth into the natural drain alongside Church Road, badly affecting houses downstream (near the Health Centre). Again, boarders as well as day students were deployed to clear earth and debris from the compounds of houses affected. There were also instances where boarders had to be pulled out from their sleep to carry out emergency de-silting work. It is great to see that after nearly half a century, the church is still standing proudly, a tribute to Fr. Mulders and the many people who directly or indirectly played a part in its construction. 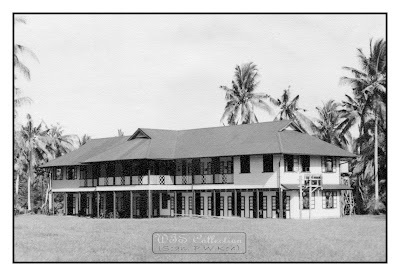 In the early 50's, all the secondary students were relocated to classrooms in a new timber school block erected at the RC Mission's properties at Mile 2.5 North Road. More than 50 years later, the same school block, with various renovations over the decades, stands serenely and majestically during a bright November day. No name was given to my maternal grandma's house situated along then Jalan Enam (6th Street, later renamed Jalan Empat) and opposite another equally old Sandakan landmark (Ming Sing School). We have always referred to it as the "Brick House". Grandma's Brick House, though extensively damaged by allied bombings and other acts of plundering during the WWII years, was one of the few structures still standing proudly after the end of the war. In this 1945 picture, renovation works have apparently started. The Brick House, probably built around the turn of the 19th/20th Centuries, can be seen in the above 1910 photo (arrowed). A similar building is located at its back. Only one of the two buildings survived the War. The two buildings, viewed from a different angle, are shown in the 1935 photo below. In the late 50's, a series of structural problems such as decaying heavy purlins and other roof beams had grandma worried. In one particularly bad incident, a heavy beam fell while grandma and some guests were having a session of 'mahjong'. The resulting thundering crash had everbody badly shaken. Grandma decided to vacate it. It was a pity that during those days, there was no Government Department entrusted with the preservation of old buildings and the prewar relic had to be demolished for safety considerations. An exchange scheme was negotiated with a developer. Grandma would give up her land in return for 2 apartment units of a 7-floor concrete building to be constructed on it subsequently. This is the last picture of the Brick House (arrowed) taken by me. 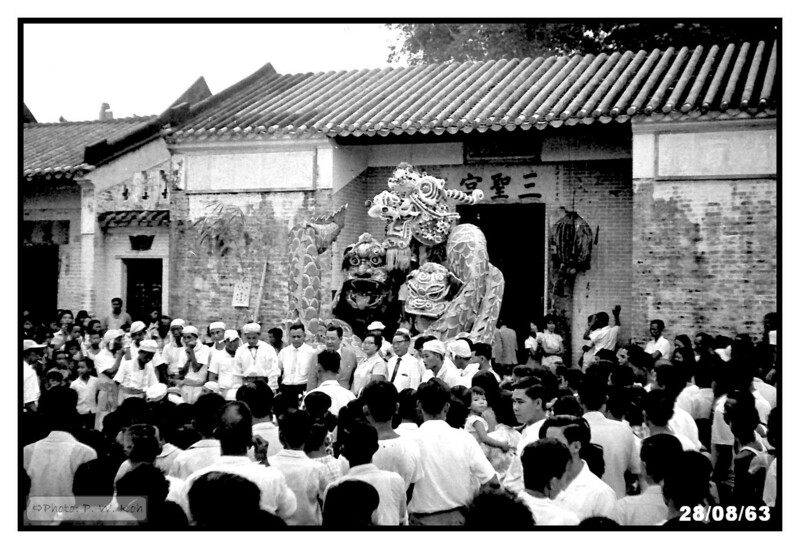 A giant image of HRH Prince Philip can be seen posted on the "Feng Shui" wall in front of the Ming Sing School. 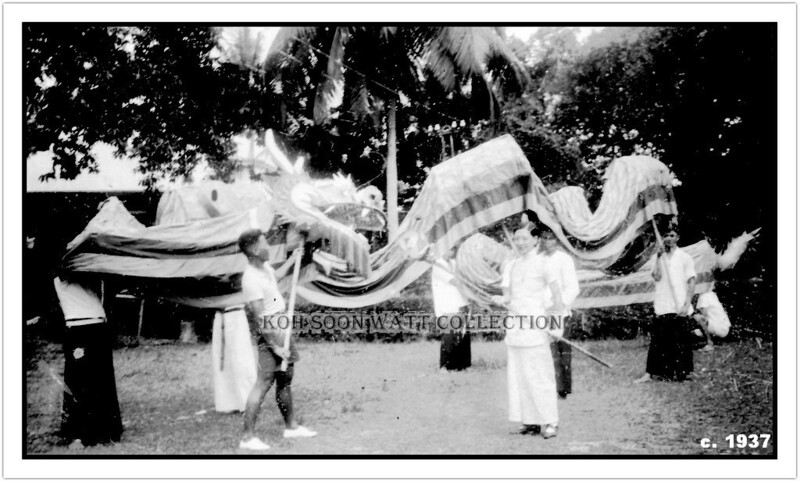 Prince Philip paid a visit to Sandakan that year. By the time this 1960/61 photograph was taken, the Brick House (arrowed) had become a memory! In pre-WWII days, members of my family had involved themselves actively in the affairs of the Hokkien Association in Sandakan (HAS). 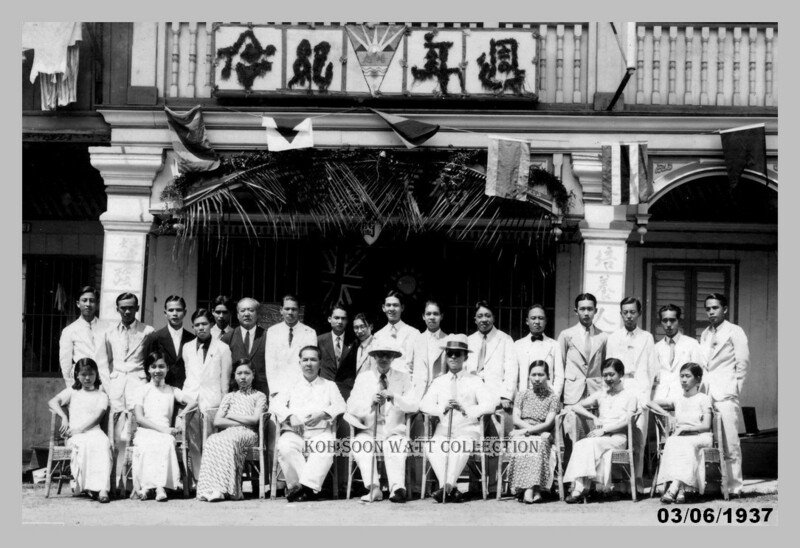 Great grandfather Kim Hin, who was the second Capitan China of Sandakan (1895-98), must have played an important role in the establishment of the association itself in the late 1880’s. Great uncle Peck Chiok was amongst those appointed to the first Chinese Advisory Board Sandakan (CABS) by the Governor in 1929. He sat in the CAB as one one of the representatives from the Hokkien community. After the end of the 2nd World War in 1945, a temporary association building was put up (above). This building served the HAS right up to the time of the completion and the occupation of the new building at the reclamation close by. 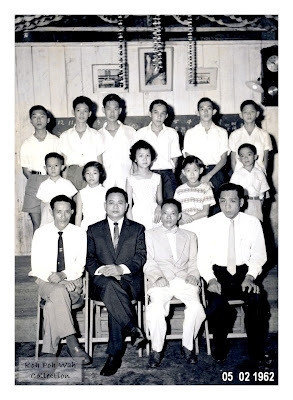 Amongst the last functions performed there was the Annual General Meeting and the awarding of scholarships to members' children on Lunar New Year Day, 1964 (below). The permanent building of the association was completed in 1963/4. The photo below shows the New HAS Building, standing prominently and alone, with most of the commercial spaces yet to be rented out. In 1962, workmen are putting the finishing touches to a building just completed along Jalan Tiga (left pix). As required by regulations or practice, reinforcement bars are left extruding from the completed structure to enable the owner of the building in the next lot to link his future structure to. Nearly 47 years on, as shown in the right pix, the owner of the empty town lot has yet to put up his building. The only changes are the few windows and awnings built into the empty wall. Like the balladeer of this Scottish song, I went back to the scenes of my childhood recently and dropped by the old house which my family stayed in between 1958 and 1962 . It was located at Mile 2.75. North Road, behind the Mobile Gas Station. It was a very solid structure, with all its beams and columns of bilian hardwood. However, the roof was still of "attap", and highly susceptible to fire. Besides, all sort of undesirable critters loved to build their abodes up there, and occasionally some would make a free fall on to us. So, the roof was promptly replaced with gleaming zinc sheets. You can hardly see or recognize the old house. (The pix was taken at about the same angle as the 2 preceding photos.) The frontage is clattered with used construction materials and equipment. (L) A close-up view of the porch which used to be a serene setting for family activities. Some of my elders would escape boredom by playing endless games of mahjong here. (R) The kitchen out-house still looks the same. On the gentle hill-slope to the right was where we used to maintain a crop of pineapples. Today, the slope is practically gone. It too becomes an extended storage area. Worse still, the earth works in the adjacent lot has caused a lot of mud and slime to course through the ground floor area which was our table tennis venue 50 years ago! In 1958, my family bought the house from a retiring building contractor. Now it is again owned by a contractor. After half a century, the ownership seems to have turned a full cycle! Along most natural streams and man-made drains, a species of small flowering plants with beautiful, blue blooms could be found. These flowers (Ruellia or Mexican Petunia) would generally bloom for a few hours. Eventually tiny green pods would emerge. When ripened, they would turn brown to dark. That would be the time when they would explode in contact with water (e.g. during rain showers). In this way, their seeds would be scattered into the running water, propagating the species to some spots nearby or downstream. Although the soft cracks of these exploding pods were hardly audible, to a child’s make-belief mind, they were as loud as conventional fire crackers! Children would collect the ripened pods and then drop them into water to watch them split open “noisily”. Inadvertently, they were also giving nature a helping hand. Such flowering plants are still readily found in most of our drains around urban areas. However, the crackles from these exploding pods are less audible due to the heavy (noisy) traffic environment. Your dad worked for the SEB, right? Were you also a scout in 2nd S'kan Troop? If so, you have a sister (Moreen) who was with us for a short while in Form 3, St Mary's Sec.